Doors trigger connections in our psyche. They serve as entries and exists and as such, co-relate to beginnings and endings. They are dual in nature, inviting us into adventure, while also being a barrier for protection. Doors in a neighborhood say a lot about the culture of an area. Are doors open or closed? What distance or levels of gates are required before reaching a front door? Who attends the door? There are many things you can learn about a people from the doors to their houses. For example, The Embera Indians of Columbia and Panama do not have any doors on their abodes. They live in small sustainable communities that have a concept of expanded family. Other communities have gates that close off an entire area. A visitor must pass through a guard before getting to a front door. I saw a small street in Siena, Italy where every door was colorful and decorated with flowers. It was warm and inviting. The doors faced right on the street where any passerby could reach out and knock. Then there are doors of condominium complexes that need to have the same look. Individual homes often decorate those doors with something personal to make their passage way more meaningful. Doors are a fascinating view of who we are, how we live? What we show the world, and what we choose to look at. No wonder there are so many artistic depictions of doors! When photographing doors, look beyond, the thing that drew you there. Let the door bring you into the journey. What does this door invoke in you, today? What does it open for you, where does it take you? Doors invoke our imagination. When you look at a door, you imagine what might lie behind it. Or you may look at a door as something that you are leaving behind. Doors are roadways to new experience, the exit point of the old. Doors can be forbidding or inviting or … just plain boring. 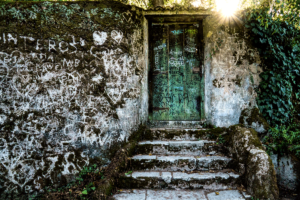 This doorway is on the estate Quinta da Regaleira in Sintra, Portugal. The 4 hectare estate is rich in architecture and symbolism relating to alchemy, Masonry, the Knights Templar, and the Rosicrucians. This locked doorway is a little off the beaten track on the estate, however by the etchings in the stone and in the door, one can tell that many have passed here. To me, the marks that people have left on this door, in this place are a symbolic ‘knocking on the door’ of knowledge and light.